Your consumers want three things from your c-store: convenience, their preferred favorites, and a reason to return to your store - for options. If you’ve often wondered how to make their in-store experience better, you might be surprised to learn how easy it is to add a little flavor to your consumers’ days. Fountain drinks in convenience stores are lucrative plus provide owners and managers with a good profit. Knowing your shoppers already find value in the fountain machines you provide, you can focus on how to make your fountain offerings even more appealing. It often comes down to what your store can provide consumers in terms of options. If you have a standard fountain machine with a footprint that already maximizes the space you can allot, you still have options for adding more flavors. Variety valves, for example, can dispense three flavors from each valve. Not only does this make your fountain smarter, it gives your consumers the options to mix and match flavors for a fun take on fountain beverages. Most of your c-store shoppers stop at your location as part of their routine, or out of convenience. Offering a fountain beverage experience that meets their needs – for consistency and swiftness – will keep them coming back. 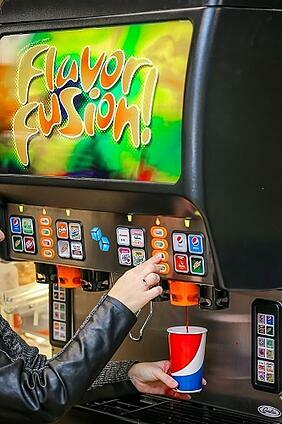 The colorful FlavorFusion machine will grab their attention while offering an impressive range of drink options. Adding extra flavors to your fountain enables your c-store consumers to craft a custom beverage to their exact preference while establishing your store as a great place for service and product. Non-carbonated options like Gatorade and G2, Lifewater, and juices. Sparkling water beverages – Izze has three new flavors of sparkling water including raspberry watermelon, mandarin lime, and blackberry pear. Tea – capitalize on the healthy “superfood” trend that so many people are fans of. Lipton tea is a best seller. Historically, convenience store shoppers were male. But, there’s been a shift in the convenience store demographic. Women now use convenience stores as much as men. 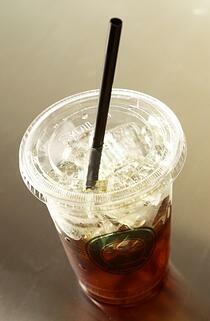 They spend more time in c-stores, and women are the largest consumers of coffee and fountain beverages. The sector sites an on-the-go lifestyle and ongoing effort to balance work and family as the reason behind seeking out convenience stores. Your store offers everything from a simple fountain beverage to a meal and appeals to a wide swath of the public. By continually improving and expanding your selection of fountain beverage options, you’ll encourage your patrons to revisit your store. Your store offers instant gratification and ability to multi-task: stop for fuel, pickup household staples or missing ingredients for dinner, and grab a fountain beverage to go. Adding flavor options to your fountain machines is an easy way to appeal to your consumers and ensure they'll become regulars.